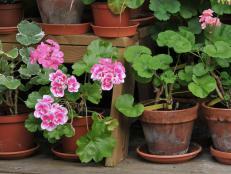 Geraniums are a plant that almost no gardener can resist. Whether it’s a classic style, an indoor option or one prized for its leaves, geraniums delight the senses each spring and summer. Learn about the four main types here. 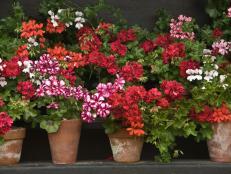 It’s no surprise these are the most popular — and, as indicated by the name, most commonly seen — geraniums. 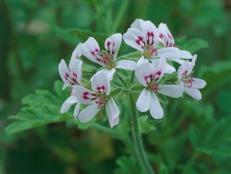 This type, which is scientifically know as Pelargonium x hortorum, may also be referred to as a zonal geranium. They are characterized by large ball-shaped blooms and are typically planted as annuals in all areas except the deep Southern portion of the United States, where they can survive the mild winters and become perennials. If you were to walk into a nursery or garden center and inquire about their geranium selection, this is most likely where you will first be taken. 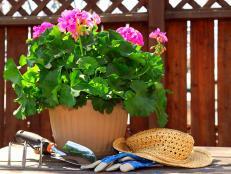 Common garden geraniums seem to thrive in both flowerbeds and containers. 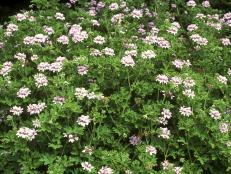 They prefer full-sun or partial shade environments and should not be overwatered. 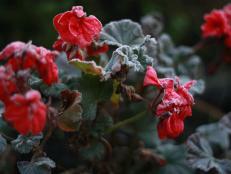 Ivy geraniums (Pelargonium peltatum) are one of the next most-commonly seen types of geraniums. 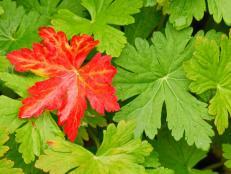 However, because their appearance differs from common garden geraniums, you may have mistaken them for a different plant. They are named for their thick, glossy green leaves, which are similar to those of an ivy plant. 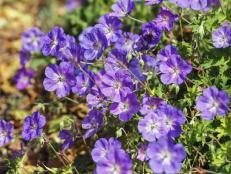 Rather than the upright, ball-shaped blooms (like the ones produced by common garden geraniums), these plants have trailing flowers, making them ideal for window boxes, hanging baskets and borders in beds. The heads of their blooms will be smaller, so plant in groupings for maximum impact. They thrive in a moist soil and should receive filtered sunlight or some shade if planted in a zone where temperatures regularly get above 80°F. Scented-leaf geraniums (Pelargonium domesticum) are prized for their abundantly fragrant foliage and only produce small blooms in comparison to other types. The leaf shapes may be rounded, lacy or serrated. They will delight your senses with scents such as apple, lemon, mint, rose, chocolate and citronella — which is known as the mosquito plant. 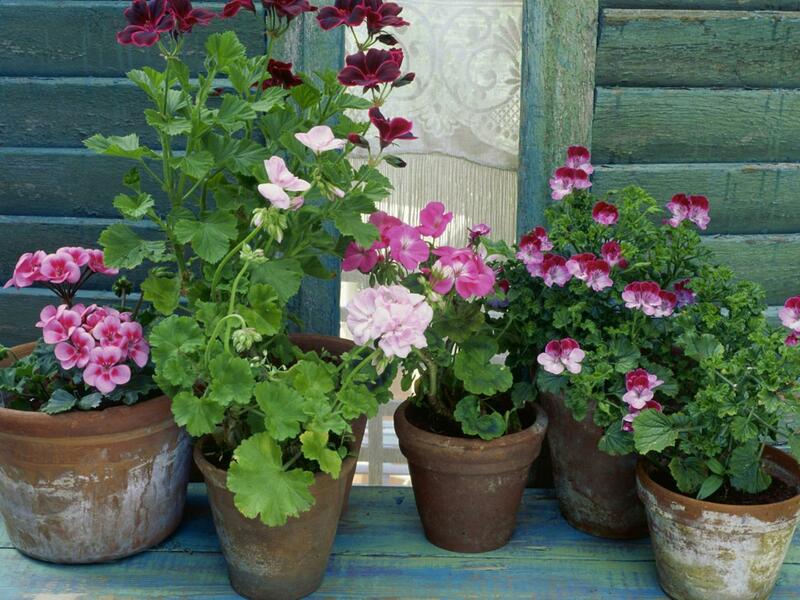 They thrive in containers with growing and care conditions that are similar to common garden geraniums. While many geraniums become indoor plants, thanks to their ability to overwinter in containers on a sun porch or similar setting, regal geraniums are truly the indoor geranium type. 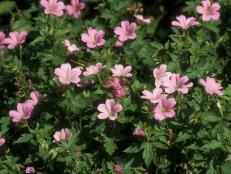 You may also hear them referred to as Martha Washington geraniums. 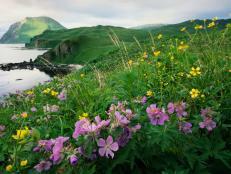 They produce bi-colored blooms and prefer cold weather. With proper care and maintenance, they can last for decades. Keep your plant’s leaves healthy and disease-free with ideas from this quick troubleshooting guide.